Much as we would like to know what pirates really, really looked like, there is little pictorial evidence available. No cameras existed at the time, and people with the talent to make accurate pictures did not hang out with pirates – or if they did (many sailors, after all, have proved talented artists) their work has been lost to time. Most artwork was paid for by the rich and powerful – people who wanted beautiful paintings of their friends or themselves, or of lovely landscapes. 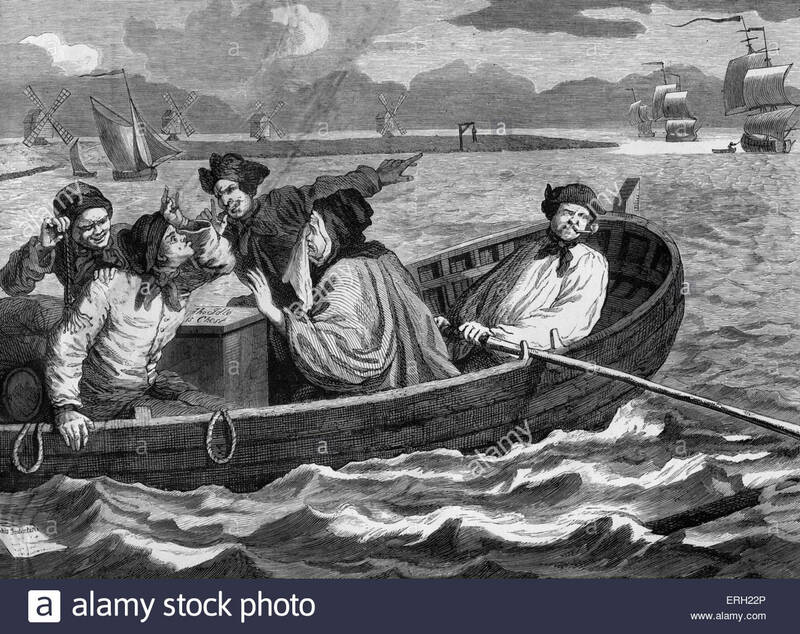 Pirates, or the poor, the downtrodden, or the often homeless or hungry people who became pirates, were not things people necessary wanted pictures of. 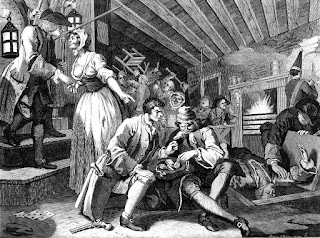 But one man – William Hogarth, an engraver with an eye for the humor and a love of the street life of London – has given us a wonderful group of works that portray what the early lives of pirates might have been. Hogarth came from the lowest rank of the middle class. He was apprenticed in his early teens to an engraver. This was an up-and-coming art form, which catered to the less affluent of London’s citizens. 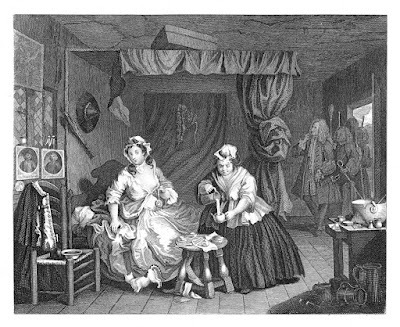 Engraving was one of the early forms of reproducing artwork. It involved etching an image into a metal plate. When ink was rubbed across the plate, it remained in the etched lines and came off the smooth metal surface. Such a plate could be used to make hundreds of images. The technique was also made an image that was much more subtle and detailed than the method of carving a picture into wood, which had come before it. 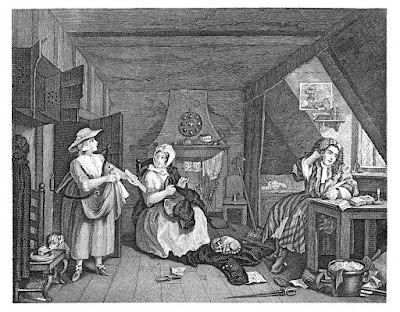 Hogarth worked in a shop that created what were called Trade Cards. These earliest versions of business cards were commissioned by shop owners to promote their businesses. The cards showed pictures – the business, or some image representing it – a sheep for a wool merchant, cupids for someone who sold perfume, and so on. The cards quickly became popular as an end to themselves (they would later be called Trading Cards) and the business of engraving pictures for them created a new art form. Hogarth was so good at his craft that he was a self-employed engraver by the age of 23, and at 27 was to create a painting. 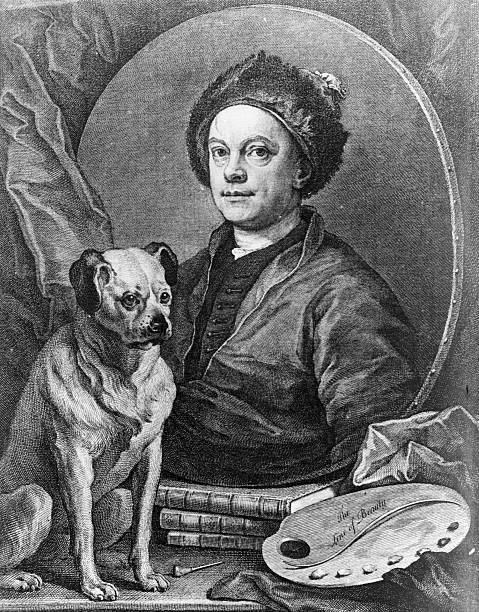 The client initially rejected the painting, saying Hogarth was “an engraver, and no painter” but he successfully sued and won the money promised in the contract. 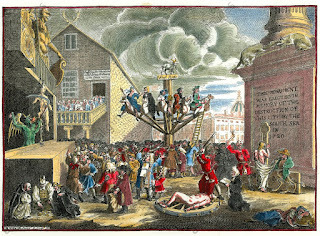 The South Sea bubble - colorized. 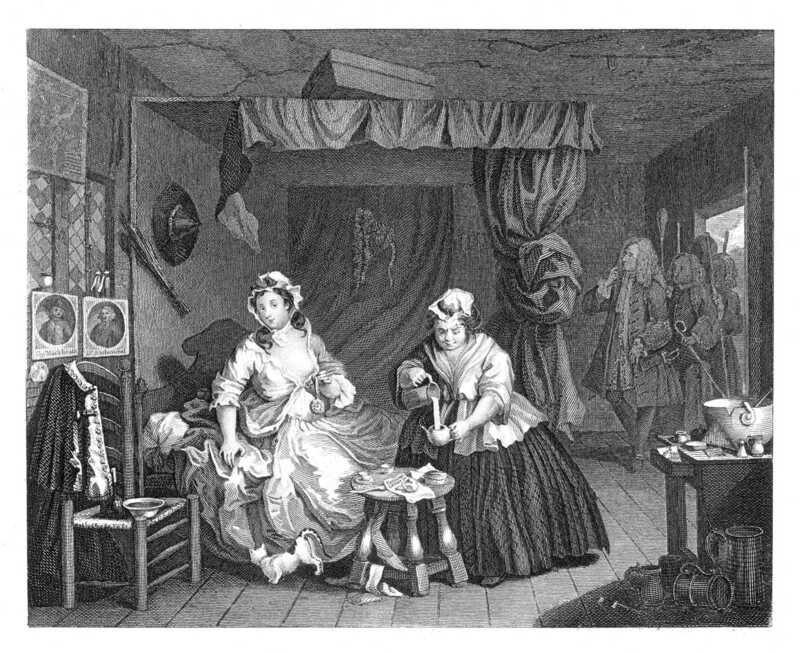 After this, Hogarth began creating large-sized engravings suitable for framing. He favored satire – in other words, humor with a message. His first work was a comedy about the so-called “South Sea Bubble.” This was a stock-issuing company that was supposed to explore the Pacific Ocean. Instead, it did little beside sell stock, in a Bernie Madoff-style pyramid scheme. 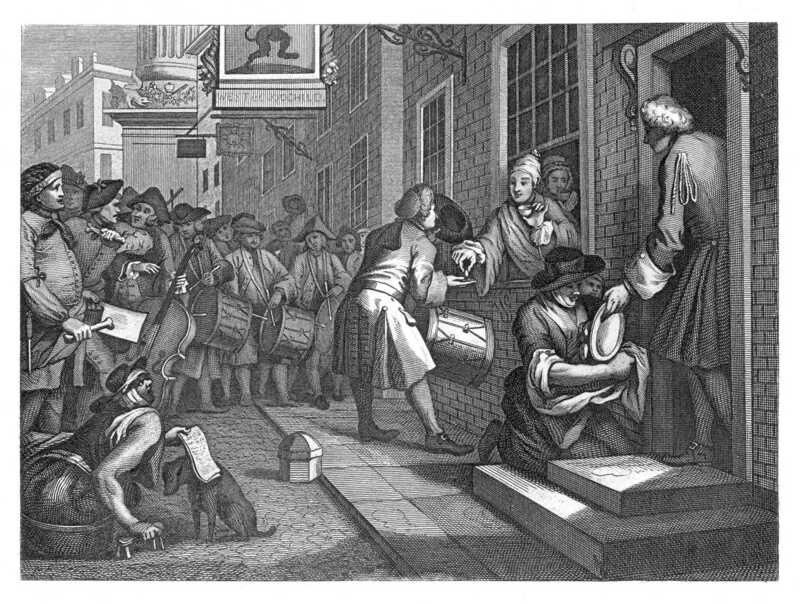 Thousands of Londoners lost fortunes, even as others clamored to get in on the action. After that, he created more works. Some were paintings of the well-to-do. But he increasingly leaned toward images of London itself, with its drunks, prostitutes, madmen and street children. One work, “The Enraged Musician,” is visual image of the sounds of the city. While a well-to-do violinist tries to practice his craft, he is enveloped by street noises. 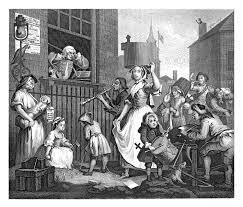 A milkmaid calls her wares, a coachman blows his horn, a knife sharpener works his grindstone, a homeless woman with a baby sings in hopes of earning a few coins. These were probably the sounds Sam Bellamy heard as a boy. 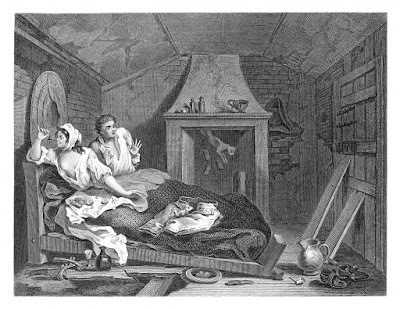 Many of Hogarth’s engravings illustrate the homes of the very poor. “The Distressed Poet” shows a would-be writer living in a garret with a foodless pantry and a bill collector at the door. In “The Harlot’s Progress,” a series of six prints, we see a young woman’s seduction into prostitution, and her slow downfall to abject poverty and death. Of special note is the third image, which shows her at home in a common small apartment. The picture is so detailed that we can make out the kinds of cheap artworks the harlot has pasted to her wall – a picture of a famous outlaw, and some trading cards, it looks like. 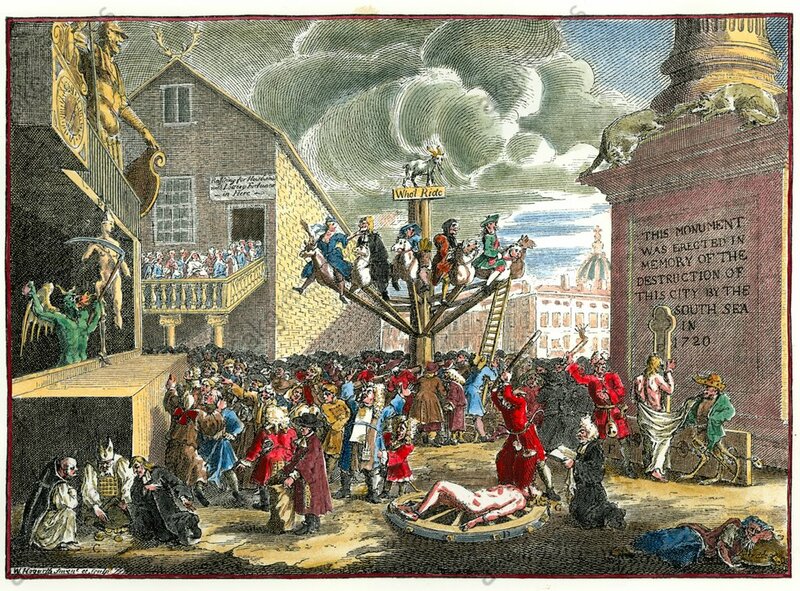 The series, “Industry and Idleness” shows the progress of two young men, one who obeys the status quo and rises through London society, the other who is put off by the dull work required of him as an apprentice and falls into bad company while looking for fun. The industries apprentice also offers some interesting details. One image shows the morning after his marriage to his boss’s daughter. 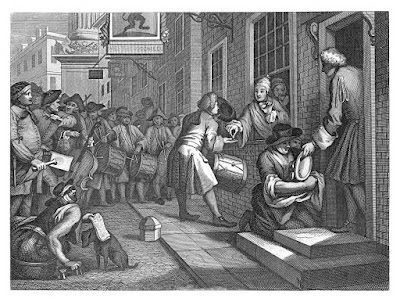 While the industrious apprentice – now an apprentice no more – hands out coins to people who have come to beg outside his window, a servant scrapes leftovers into the apron of a poor woman, who seems mighty pleased to have them. Notice the woman by the door receiving table scraps. A certain level of poverty there folks. When the leavings off someone’s plate is a treat. 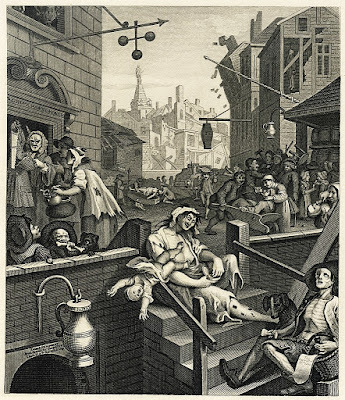 Lastly we will look at the twin pictures “Beer Street and Gin Lane.” These imaginary streets show the difference between the best side of the English lower classes – the idealized beer drinkers, and the kind of poverty caused by people trying to drown their sorrows in gin. Gin was a new drink in England, and because it was strong and cheap it was causing social problems. 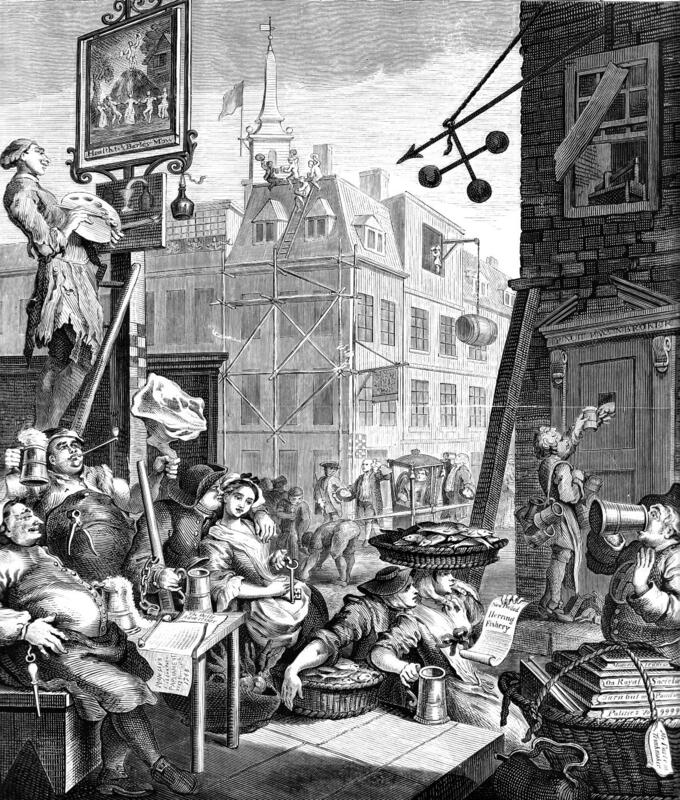 On “Gin Lane” people pawn their tools and household goods to buy liquor (the three balls over the door signal a pawnshop.) We see people starving, fighting with dogs for bones, abandoning their children, and dying young, as buildings collapse form neglect. On the more idealized Beer Street, everyone seems happy and healthy. 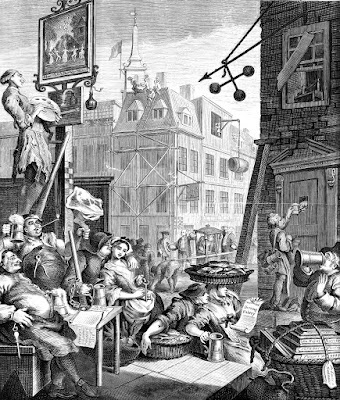 (It is interesting to note that British beer is so nutritious that even today, British alcoholics do not suffer the same malnutrition as American ones.) 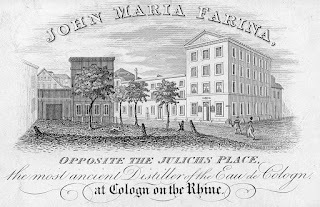 It may be interesting to note the couple “making out” in the street, as well as the ragged condition of the artist painting an advertisement for gin. 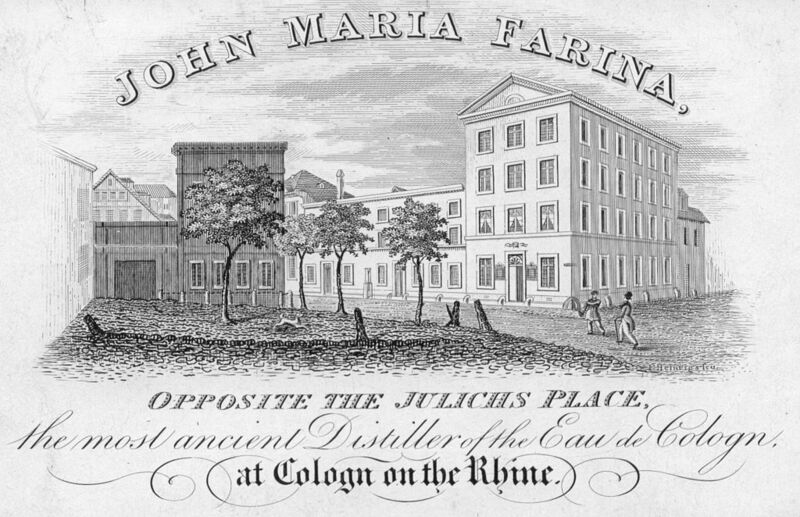 A single blog can't even begin to scratch the surface of these engravings. I strongly urge you to look at some of them yourself. In a world with Google Images it's easy to see his work. Look, and look deep - there's a three hundred year old world in there.